According to the Food and Agriculture Organisation of the United Nations, bees are responsible for pollinating 71 out of the 100 crops that provide 90% of the world’s food supplies. In recent years there have been numerous campaigns and initiatives to nurture bee colonies against threats such as overuse of pesticides, including the proclamation of the World Bee Day last year. This has also led to a rise in bee-keeping in cities – not only to promote planting in urban areas, but also to produce small-batch honey. 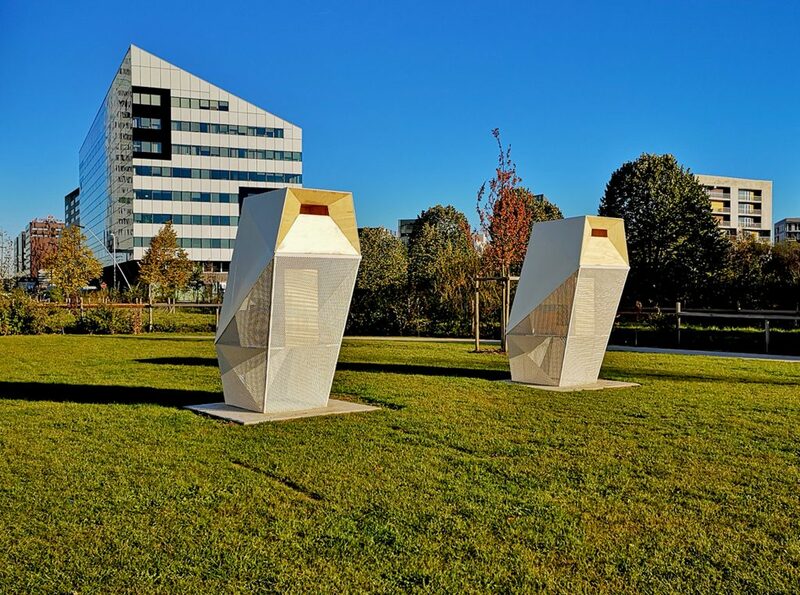 B Plus B Architectures in collaboration with graphic designers Studio Corpus, and landscape architect Slap, designed two beehives for the Parc des Dondaines in Euralille, an urban district in the centre of Lille, France. The urban environment is actually perfect for beehives because the plants that grow in towns and cities are less infected by pesticides than those in farming areas. Towns and cities also offer slightly warmer air temperatures and a large variety of flowers. The Lille site is a large esplanade — a place of peaceful contemplation for people and a great habitat for bees. 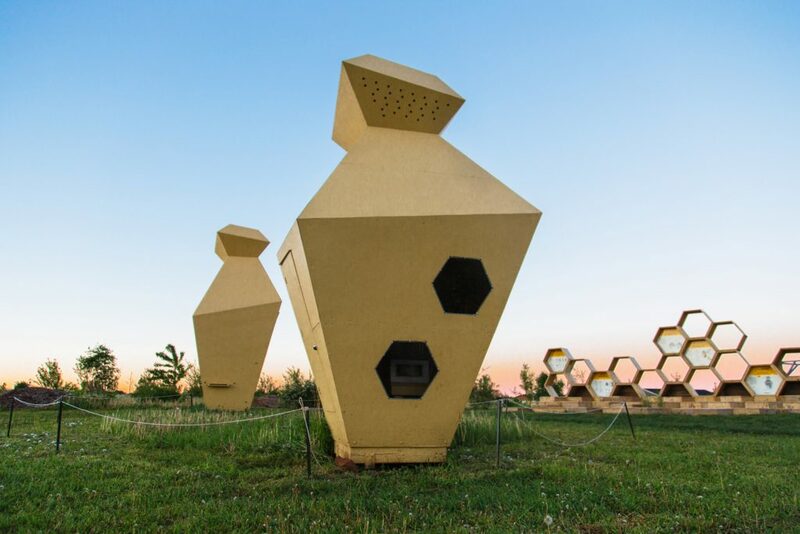 The two hives were designed as big owls — totemic animals to protect them inside their white-steel, geometric bodies. The rich honey harvested from them is sold locally. 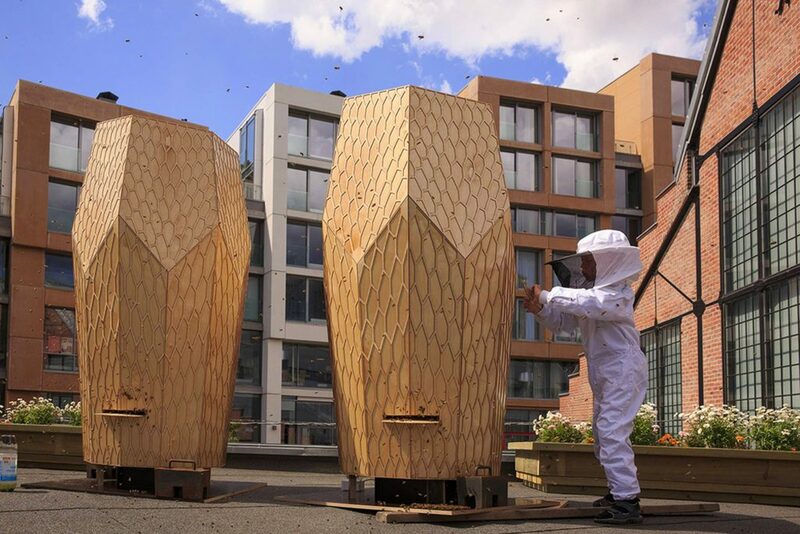 The Urban Beehive Project by Nine Yards Studio is a Charlottetown-based architecture and design practice on Prince Edward Island that was created with a vision to establish a community project. Housed in Charlottetown’s largest Urban Garden at the PEI Farm Centre, the hives are placed in individual sculptural structures which act both functionally — to provide a learning platform for the public and aesthetically to act as engaging public art that draws people to the site and creates a destination for bee education. The centre highlights the importance of bees and their role in a sustainable environment, featuring demonstrations that encourage a hands-on approach to bee education, allowing the public to see how honey is produced. The public can look inside the two Plexiglass windows to see the bees working inside and also watch the bees exit and enter at the ‘bee landing pad’ as they deliver pollen. The hives are constructed with wood, a locally available, sustainable material and are secured in place by helical anchors that make a minimal impact on the land. 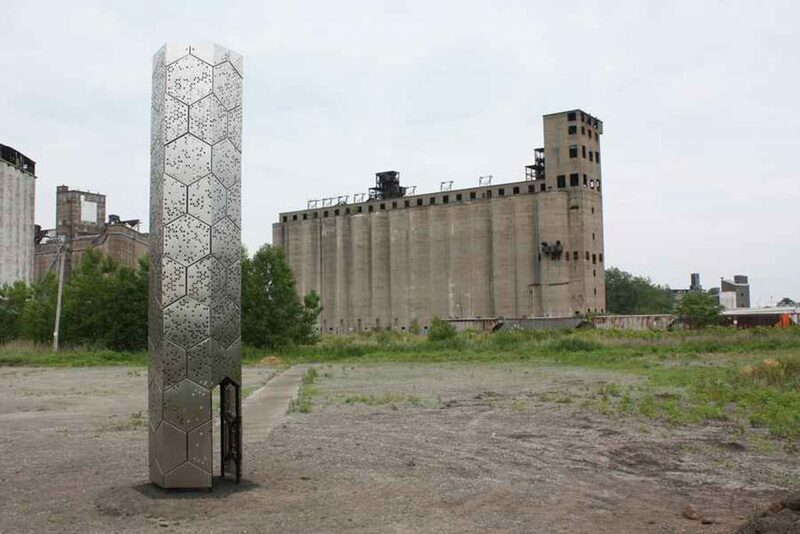 Elevator B is a collaborative project between graduate students from the University at Buffalo School of Architecture and Planning, the Department of Architecture’s Ecological Practices Research Group and Rigidized Metals, a Buffalo-based building material manufacturer. The material properties of the tower represent the cluster of material manufactures now located around the site while at the same time housing the colony of bees. Visitors enter the tower from below and look up, similar to the way one experiences the silos and bins of the nearby Marine A elevator. The 22ft tall, honeycombed steel structure was designed and built utilising standard steel angle and tube sections. 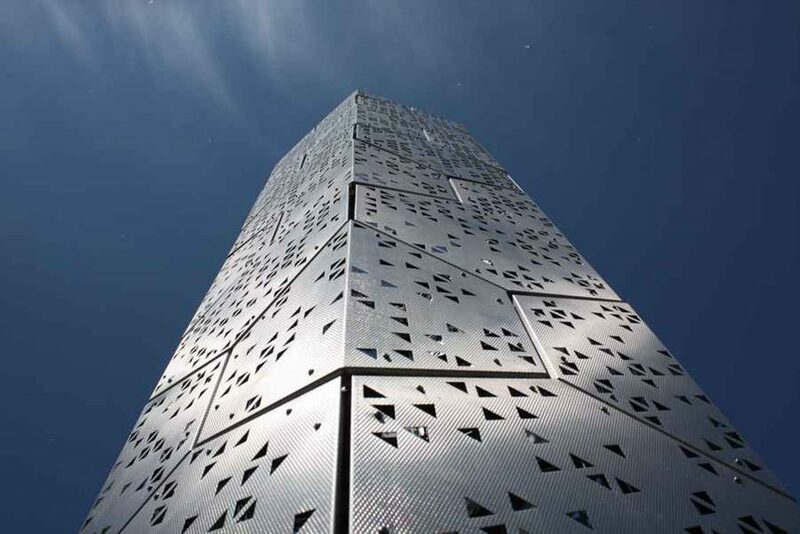 It is sheathed in perforated stainless-steel panels designed to protect the hive and visitors from the wind and allow for solar gain and shading. The bees are housed in a hexagonal cypress box with a laminated glass bottom through which visitors can watch them working. The box provides protection and warmth, while also separating bees and humans. Professional beekeepers access the hive by lowering it and this feature also caters to visiting school groups, which get a close-up view. The tower’s orientation also frames key views of the surrounding historic grain elevators and the new upcoming developments of Silo City.